Ocho is eight in Spanish. With this work I wanted to explore the virtuosity of the solo performer. I worked one to one with each of the eight dancers in the piece, developing the physical language of each. It was a chance to really dive into the humanity of their bodies and focus in on each dancer and their uniqueness. It’s a very different way for me to approach a dance piece, to really hone in on the individual rather than structuring movement with many dancers at one time. The work takes place in an environment that is very urban, very much built by human hands. 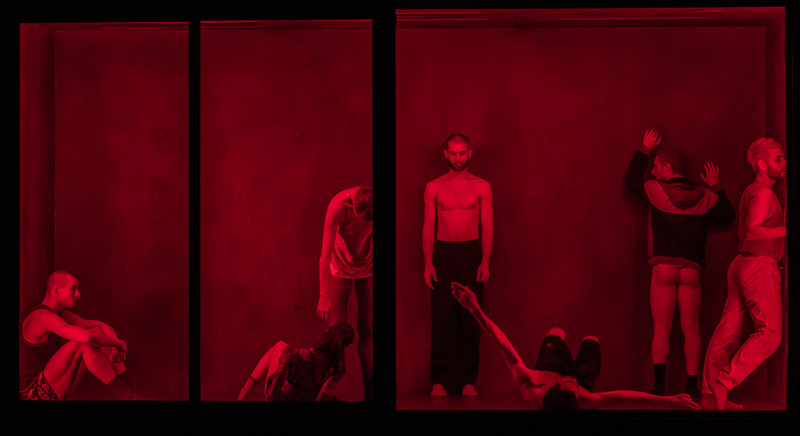 These eight dancers start in an abstracted glass box, almost under scrutiny, and they move through a physical space, which threatens to dwarf them, a factor that for me highlights the individuality of these dancers. They watch and are watched. The physicality of the set is imposing and very solid. The work is in part about a process of moving through the edifice of this built environment. At what point do we get stuck, how do we break out of and move through these spaces? I would like to thank my collaborators whom have all thrown themselves into creating this world of Ocho. I particularly want to thank the dancers, they invested their emotional and physical selves into the creation of the work and then they do so again with each performance of it. Please tell us about your collaboration with Rafael Bonachela and some of the ideas behind the design of the set. Rafael was very flexible and open to ideas at the beginning of our collaborative process. He was interested in using a set again (like in Frame of Mind, 2015) and together we wanted to explore what a set could provide dramaturgically to the dance work. We wanted to create a space in which to explore the relationship between the dancers and the relationship between the dancers and the set. The set design is based on the choreographic framework of Ocho where eight solo dancers eventually come together to form a group. With all the dancers in the space at the same time, I asked myself the question of what are the other dancers doing during the solos? The room is my answer to this question. The set houses the eight dancers in a space as they show off their stamina, virtuosity and strength. The set defines the tension between the individual and the group. When designing the set I looked at a range of images of commercial, religious and domestic buildings for inspiration however the set doesn’t represent a specific location or environment. What are some of the similarities or differences between working in dance and theatre? The starting point is different in dance as there isn’t a prescribed script or text. My process of response in dance is different to theatre as I’m responding to the music, to my inspirations and instincts and to the inspirations and instincts of the choreographer and dancers. It’s a much more organic process. I find working in dance is more open-ended, more instinctual and more exploratory. As the dancers are stuck in this abstract, monumental space, the costumes are about recognising them as human beings. For that reason I’ve chosen real, found clothes for the costume with each individual dancer dressed differently. I wanted to represent how this collection of eight, very unique and dynamic individuals were connected in the space and experiencing something together. The choices I’ve made aren’t based on the character of the individual dancer but respond to their physical language. For example, I see Juliette has long extensions in her movement while Nelson has a very grounded movement quality, so the costumes I hope will complement these aesthetics. I have chosen a broad spectrum of colour and texture with some reference to 80’s and 90’s photography of social portraiture. This wasn’t a starting point but I realised there was an underlying thread through the choices I was making and recognised there was a link back to some underground photography of that era. Who or what are you inspired by as an artist? I’m mostly inspired by photography and installation art. I appreciate the filtration of the real world through these art forms. One example of the type of artist I admire are the duo Michael Elmgreen and Ingar Dragset whose work draws from diverse disciplines such as social politics, architecture, performance and design. Download this interview as a PDF. Ocho means eight in Spanish. For Rafael Bonachela, the number eight is quite significant to him this year as it is his eighth year of being Artistic Director of Sydney Dance Company. In Ocho he works with eight dancers; this is the first time he has created a new work for Sydney Dance Company with a smaller ensemble of dancers. It is also the first time that Rafael has set himself the challenge of focusing on the solo performer. As a choreographer he is instinctively drawn to creating duets and structuring group work with his dancers but for this new work he wanted to explore the creation and performance of solos, which the smaller ensemble gave him the opportunity to do. Rafael Bonachela worked closely with each individual dancer to develop a physical language that was unique to them. It is this individual physical language that defines the dancers in Ocho, rather than a character they are portraying. The Company dancers were very much involved in the creative process and share some of their individuality and personality in their solos. In numerology, the number eight is associated with powerful personality traits and states of being such as self-confidence, inner strength, courage, authority and ambition. Even though the dancers didn’t create their solos using these words, Rafael displayed these words on flashcards around the room to influence the dancer’s movement while they were devising their solos. There is a clear connection between these words and the attributes needed when creating and performing a solo. An interesting connection to the number 8 is that when it is flipped on its side it becomes the symbol for infinity. Although the abstract concept of infinity isn’t neccessarily explored in the work, Rafael did task the dancers with creating continuous movement, with no clear beginning, middle or end. Rafael also recognises that there is a nice connection with the fact that when choreographing, there is an infinite number of possibilities. Aim: To create a movement phrase using the lines in the image to direct your movement. – Either use the octagon image included or create your own similar image by drawing your own intersecting lines through the shape. In the supplied image you may like to select 8 – 12 lines to trace with a marker so you’re clear on which lines you are following. – Imagining the shape on different planes and using a variety of different body parts, find ways to draw or make the lines you see with your body. – Explore how many different ways you can interpret this task and make shapes and lines before setting any movements. – Once you’ve explored, create a movement phrase of 8-12 movements. – If your phrase is becoming too stationary consider how you could make some movement travel. For example, could a body part lead you. Aim: To create a group sequence using a figure of 8 floor pattern as a starting point. – To begin, watch the section from Ocho to help your understanding of this activity. – Each individual finds their own figure of 8 floor plan in the space. Think about the direction and size of your figure of 8. – Altogether, everyone walks their figure of 8 pattern making note of when you cross paths with someone else. – Repeat the pathways numerous times so everyone is clear on how to negotiate their path and that you are meeting the same people at the same point each time. Make clear eye contact with everyone you meet. – Some rearranging of pathways or timing might be needed so everyone in the group has the opportunity to cross paths with a number of other individuals. Limit the number of interactions (perhaps to four) so there isn’t too much to remember! – Find a way to physically connect with each person you meet. This could start off improvised and then become set. Think about the shape of a figure of 8 to inform the movements you make. Use circular, twisting actions. Each time you repeat your figure of 8 develop the connection with the same person so that the movement becomes bigger and more complex in some way. – Continue until you have built a short sequence that can be remembered and repeated. Walking can build to running or different locomotor moments if time allows for further exploration. Aim: To use qualities and/or states of being to influence the way you perform your solo. Resource: A solo you have already created either using the octagon task above or another solo you are familiar with. – Select one or a number of the words from the list below to influence the way you perform the movement in your solo. – Consider how the words might change the space, time, dynamics of your solo. – How different is the solo after this activity compared to the original version and how is it different? 1. Considering all aspects of the performance (movement, music, set and costumes), what is your interpretation of the performance? 2. Can you think of examples in life where you could observe how individuals interact within a group? For example, students in a classroom, passengers on a bus. Do you notice if people take on different roles within the group and do you see the same roles appearing in different situations or settings? 3. How is the movement that takes place in the glassed room different to the movement that happens outside that space and how do the relationships between the dancers change? 1. What engages you when watching a solo performance and what do you think about when performing a solo? In what way is it different for you when performing a solo compared to performing in a group? 2. When watching VIDEO 3 can you see any suggestion of the task in the movement that is being performed? Does the movement incorporate mostly straight or curved lines? 3. When watching VIDEO 4 can you follow the pathway of one dancer to see if a figure of 8 is formed? 4. What is your understanding of infinity? How could you use the idea of ‘limitless’ or ‘boundless’ as a stimulus to create movement? 1. What does the set remind you of and what do you think the people are doing there? 2. How would you describe the set? What materials do you think have been used? 3. How would you describe the individual dancers based on their costumes and movement language?